Base: signature premium, organic, real fruit sorbet. The signature premium is the ultimate experience in texture and taste. The organic option is KSA Kosher and non GMO. Real fruit sorbet is, of course, the healthiest option to choose from. 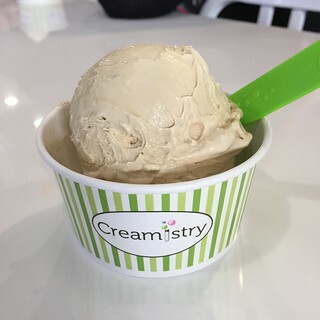 Flavor: Creamistry has an extremely wide range of flavors to select from (up to 40), and they have generic flavors like cookie butter, caramel, favorites like Captain Crunch and Chips Ahoy as well as trending flavors like sea salt caramel and Madagascar vanilla bean. Topping: Many of the popular toppings are offered like gummi bears, M&M’s, butterfingers, nutella and marshmallows. Unique toppings include mochi. Tasting the ice cream I discovered that the secret to creating creamy ice cream is to rapidly freeze the mixture. Traditional ice cream is made in a batch freezer where it takes about 45 minutes to freeze cream into ice cream. 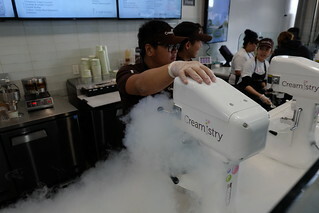 Because liquid nitrogen is so cold, it causes the milk particles to stay very small and not form into ice crystals, leaving an ultra smooth creamy texture. 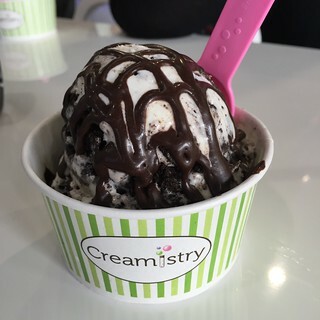 After tasting their ice cream, I found it to be very rich, super dense and yes, very creamy. My wife ordered the cookies and cream topped with chocolate fudge sauce and I ordered coffee ice cream. If it were located near my house, I think I would be a regular! 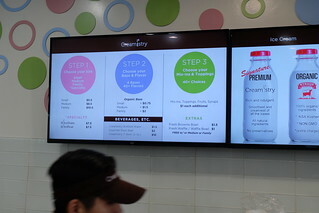 While I visited their Rowland Heights location, they also have shops in Alhambra, Beverly Hills, Costa Mesa and Irvine. 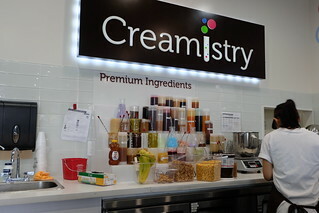 Creamistry is tucked inside the Diamond Plaza next to the Shell station in Rowland Heights.